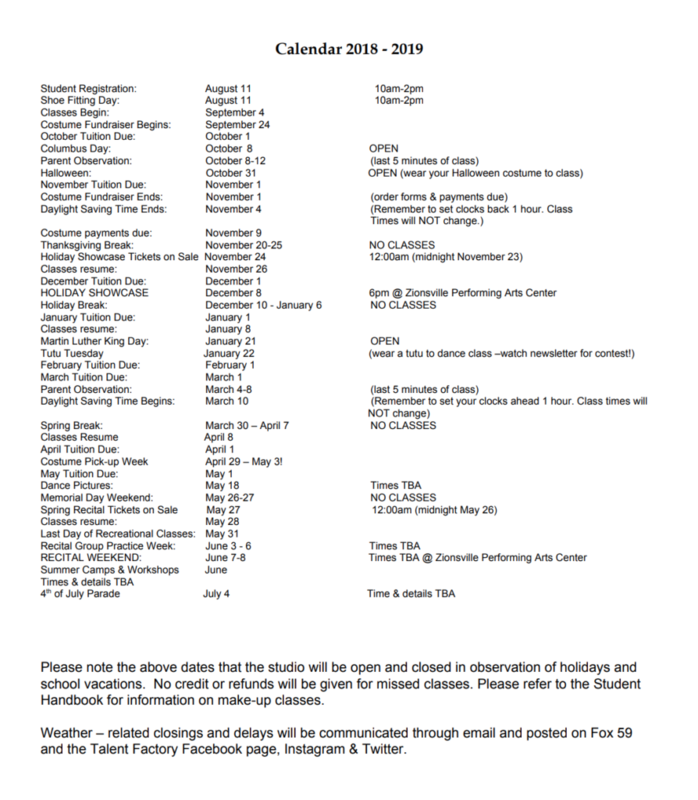 Please note the above dates that the studio will be open and closed in observation of holidays and school vacations. Students are welcome to arrange for make-ups to accommodate their particular vacation or holiday plans. It is your responsibility to arrange with the office to attend a class that is the closest fit to the class you will be missing. If you request a make-up class, it must be completed within 1 month of the absence. No credit or refunds will be given for missed classes. Private lessons may be scheduled for a fee of $30 per half an hour. If you have any questions, please check with the office manager. Weather – related closings and delays will be posted on Fox 59 and the Talent Factory Facebook page, Instagram & Twitter.